The first “Iron Man” was a bona fide hit in the summer of 2008, a minor-property superhero movie based on a Marvel Comics character that was arguably never in the same league as say Spiderman or X-Men. But thanks to its offbeat humour and unadulterated sense of fun, it proved to be a breath of fresh air from the usual sombre superhero movies, possessing an unbridled energy that made it one of the biggest crowd-pleasers of the year. Then came this highly anticipated sequel which, like Tony Stark’s ego, has certainly grown bigger. From just one villain in the original- Jeff Bridges’ Obadiah Stane- there are now three- Ivan Vanko, better known as Whiplash (Mickey Rourke), the Russian scientist with a personal grudge; Justin Hammer (Sam Rockwell), a rival entrepreneur also into the weapons industry; and a nasty senator (Garry Shandling) out to confiscate Iron Man’s suit for the US military. Bigger too are the number of metallic suits around, as Colonel James Rhodes (Don Cheadle taking over Terrence Howard’s role in the original) himself gets to don another silver-plated suit alongside Iron Man’s red and gold-plated one and Vanko designing his own Whiplash suit and other such remote operated droids to go up against Iron Man. So really, it stands to reason that one might expect this sequel to be twice as much fun and packed with twice as much energy. 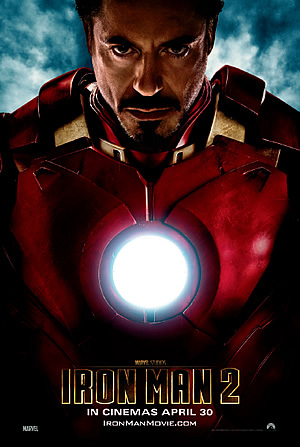 Truth is, despite two Iron Mans around, “Iron Man 2” is only half of what its predecessor was. Having gotten the origin story of how Tony Stark came to be Iron Man out of the way, this sequel sees Stark faced with different challenges just as he begins to settle into his dual personas. His blood is fast turning toxic and without a new power source to replace the lithium that’s poisoning him, he knows he will soon die. Stark also has to deal with his own ego, which from his dramatic entrance into his own Stark Expo, has grown too big for his own good. Add to that the unsavoury trio of Whiplash, Hammer and Senator Stern, and one can definitely say that Stark has more than enough to keep him occupied. It seems therefore ironic that the audience should end up feeling detached, and in fact indifferent, to the sound, fury and mayhem going on in the movie but that’s how exactly one feels, especially during the second half. The film spends its first half busy introducing the bevy of new characters- including a thrilling debut of Vanko’s prototype Whiplash suit during a Monaco street race bound to set your heart racing- as well as the different situations confronting Stark. Yet, screenwriter Justin Theroux (who also wrote Tropic Thunder that starred Downey) doesn’t quite know what to do with everything that he’s set up and ends up doing disappointingly little. Indeed, the next time Whiplash confronts Stark again will be at the massive battle at the end of the film. 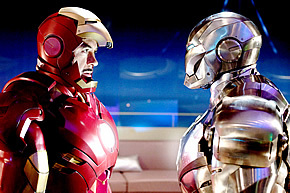 In between, Stark only suits up once more in a petulant display of arrogance at his own birthday party, terrorising his guests and leading to a confrontation with Rhodes which sees Rhodes acquiring one of Stark’s metallic suits. The other displays of Stark’s growing disenchantment with his Iron Man persona are portrayed through increasingly tiresome banter with Pepper Potts (Gwyneth Paltrow), the newly-appointed CEO of Stark Industries, that lack the wit and the humour of the original. “Iron Man 2” is also saddled with the need to set up for Marvel’s huge superhero blockbuster of 2012, “The Avengers”- and Samuel L. Jackson’s Nick Fury and his SHIELD organisation are now properly inserted into the film, together with Scarlett Johannson’s Black Widow, Fury’s spy to make sure Stark doesn’t misbehave. Still, the scenes with Fury are noticeably ambiguous, and do less to the central story in the film than to set up the preceding events for another movie. But as in “Iron Man”, the reason the movie still proves entertaining despite its many flaws is the enigmatic presence of one Robert Downey Jr. Reprising the character that was responsible for his career revival two years back, Downey’s charismatic performance, complete with his spot-on comedic timing for self-deprecating humour and that knowing glint in his eye, ensures that Stark remains endearing in spite of his obvious, and sometimes exaggerated, egotistical ways. In fact not just Downey, but the rest of the cast are also just as outstanding in their respective roles. Mickey Rourke makes for a convincingly sinister villain (though he could do with more screen time), with the generous help of the CGI wizards at Industrial Light and Magic. Sam Rockwell too is a good foil to Downey’s Stark as the two play off their professional rivalry nicely. And once again, the chemistry between Paltrow and Downey proves a winning combination that makes the romantic angle of their relationship more persuasive than the screenplay allows. It’s probably a foregone conclusion whether or not you’d go to the cinemas to see “Iron Man 2”. Why not? It’s been hyped as one of the biggest movies this summer and on many levels, mostly thanks to Downey and the rest of the cast, it does deliver. But compared against the zest and the energy that the original had when it first burst onto screens two years ago, “Iron Man 2” just doesn’t measure up to the merits of its predecessor. Instead, this feels more like the typical loud and hollow action blockbusters of Hollywood summer movies than the honest-to-goodness crowd-pleaser in 2008 that won both critics and audiences alike.